The botanical name of the Arrowhead Violet is Viola Betonicifolia, it is an evergreen perennial, also referred to as the Mountain Violet is a species of violet native along the eastern side of Australia mainly along the Great Dividing Range, which Toowoomba sits on. 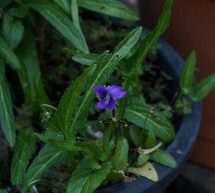 This species of violet is also common in India and Pakistan. So named due to the shape of it's leaf in the formation of an arrowhead shape, in comparison to its European cousin Viola Odorata which instead has a large heart shaped leaf formation. The violet prefers a semi shaded rockery environment such as the edge of forests. The Australia Fritillary Butterfly, which is now almost extinct is dependent on the Arrowhead violet for existence. Spring Bluff Railway Station forms part of the Ipswich to Toowoomba rail line. Construction of the line began in 1864 and the premier train came through Toowoomba in 1867. Originally known as Highfields Train Station, it was renamed Spring Bluff Railway Station in the later part of the nineteenth century by then Queensland railway commissioner Robert John Gray. The namesake comes from the spring water and sandstone bluffs (broad rounded cliffs) that were prevalent in the area, hence ‘Spring Bluff’. The railway station today itself serves no operational capacity, this having been ended in 1992, but it still serves as a reminder of the railway heritage and famous garden landscapes of the area and social significance at the time. The station was heritage listed by the National Trust of Queensland in 1994. The aim was to showcase works of art from the Toowoomba region, and to that extent, the gallery itself was established by the Toowoomba Art Society in 1937. Originally located in a section of the Toowoomba City Hall, and eventually consuming an entire floor, the gallery is the oldest public regional art gallery in Queensland. A movement to give the art gallery a dedicated premises by the Toowoomba Art Gallery Society culminated with an old office building adjacent to the Toowoomba City Hall being purpose modified and fitted to accommodate three times the area of the gallery's former location. In 1994 the gallery relocated to its present location, 531 Ruthven Street, Toowoomba, and the gallery now hosts approximately 3000 pieces of artwork. The Gallery has three permanent collections, those being the Toowoomba City Collection, the Lionel Lindsay Gallery and Library and the Fred and Lucy Gould Collection. The Gallery also offers a section dedicated to local artists as well. The Gallery itself is owned and run by the Toowoomba Regional Council and offers guided tours and a Gallery shop with great gift ideas. The Willow Springs adventure park was established during the 1970's. It was located on a 40,500 square meter (10 acres) in the Toowoomba suburb of Kearneys Spring at 333 Spring St. The recreational adventure park included included many outdoor activities and barbecue areas. The park was sold and eventually shut down and reopened as 'The Springs Garden World' nursery.